How the simulation and visualization technologies so pervasive in science, engineering, and design have changed our way of seeing the world. Over the past twenty years, the technologies of simulation and visualization have changed our ways of looking at the world. In Simulation and Its Discontents, Sherry Turkle examines the now dominant medium of our working lives and finds that simulation has become its own sensibility. We hear it in Turkle's description of architecture students who no longer design with a pencil, of science and engineering students who admit that computer models seem more "real" than experiments in physical laboratories. Echoing architect Louis Kahn's famous question, "What does a brick want? 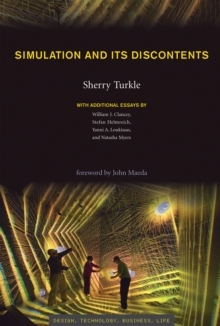 ", Turkle asks, "What does simulation want?" Simulations want, even demand, immersion, and the benefits are clear. Architects create buildings unimaginable before virtual design; scientists determine the structure of molecules by manipulating them in virtual space; physicians practice anatomy on digitized humans. But immersed in simulation, we are vulnerable. There are losses as well as gains. Older scientists describe a younger generation as "drunk with code." Young scientists, engineers, and designers, full citizens of the virtual, scramble to capture their mentors' tacit knowledge of buildings and bodies. From both sides of a generational divide, there is anxiety that in simulation, something important is slipping away. Turkle's examination of simulation over the past twenty years is followed by four in-depth investigations of contemporary simulation culture: space exploration, oceanography, architecture, and biology.